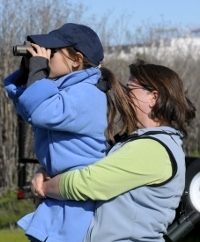 Napa-Solano Audubon Society has a kid-friendly birding group, Junior Audubon! Younger birders tend to be highly motivated and learn quickly, but they can have difficulty finding ways to connect to each other and often get lost in adult-oriented bird outings. Junior Audubon hopes to remedy these issues by offering a free group exclusively for teens and pre-teens. The group meets twice each month for two hours. Parental attendance is optional. The outings are set in different habitats near Napa, focus on improving birding skills and learning bird ecology. Check the Calendar page to see dates times, and descriptions of upcoming walks. For more information, email Crystal DeMarco, Junior Audubon Director, at crystal.napasolanoaudubon AT gmail.com. Presentations for classrooms or youth groups are offered by prior arrangement. The program usually includes an overview of why birding is fun, a beginning birding video, an exploration of feathers, bird skulls and nests. Additional birding activities, games or art may also be included as time allows. The program ends with a guided bird walk in the schoolyard or nearby park (binoculars can be provided on loan). Email Crystal DeMarco at crystal.napasolanoaudubon AT gmail.com for more information. Educational exhibits and birding activities are offered at various community events through out the year, including the annual San Francisco Bay Flyway Festival, Earth Day events, California Native Plant Society sales and garden workshops, and others. These usually focus on the importance of "citizen science" and invite participants to become involved with our 'Hummingbirds at Home" project, or eBird, or other monitoring projects. There are between 8,700 and 10,000 different species of birds, and while all birds have wings, not all birds can fly. Birds live all over the world in all types of habitats, from the coldest to the hottest and from the wettest to the driest areas. Birds vary greatly in size, ranging from very large ostriches to the tiniest of hummingbirds. If you study birds near your home and in your backyard, you can learn about the features and behaviors of these fascinating animals.